Is Your Home Protected Against Power Outages? When Did You Last Change Your Air Filter? Whether we’re talking about rewiring or an electrical panel upgrade, chances are if you’re in a home over a few decades old, you’re going to need one or both of them at some time. Electrical problems are nothing to mess with. While a plumbing problem can inflict water damage and an HVAC issue can inconveniently leave you uncomfortable for a little while, electrical problems are actually dangerous. Sure, it’s fun to joke about how your house is haunted but let’s face it, this probably isn’t the case. The actual cause of flickering lights is almost always a short circuit in your electrical system. If it’s just a lamp or some other lighting fixture, it might be that you need to only replace that lamp and nothing else. If, however, it’s impacting an entire room or section of your home, then the short circuit is more widespread and requires management. If you experience this problem frequently, we highly recommend that you call in a pro sooner than later! 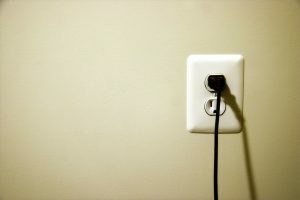 Have you ever placed your hand on a light switch, or even just a random area on a wall, and felt that it was warm? Hot spots typically indicate points in your electrical system where electrical current is flowing in a direction that it shouldn’t be. Electrical current that is diverted to a point where it’s not supposed to be will throw off a lot of energy as heat, and this is what you feel when you notice a hot spot. Hot spots are a sign of a very serious electrical breach—one that could potentially cause a house fire. You don’t ever want to ignore this sign of electrical problems, so be sure to call for electrical repair as soon as you notice it. It may end up that you need a wiring or panel upgrade. Do note in all of this, however, that dimmer switches do operate a bit differently and will usually be warmer than traditional on/off switches. The circuit breakers of your electrical panel are designed to protect your home from power surges. When a portion of your home’s electrical system suddenly starts to carry voltage beyond safety limits, the circuit breaker trips and that part of the system is shut down until the problem can be fixed. In most cases, a circuit breaker will trip because you just overloaded the circuit. Unplugging a few things and then resetting the breaker are often all that’s required for this kind of thing. However, if your circuit breaker keeps tripping, then you may have a bigger issue. Either there’s a more serious problem with that particular circuit or the appliance(s) connected to it, or the circuit breaker itself is malfunctioning, Whichever the case, it needs to be addressed by a professional ASAP! At Covenant Heating and Cooling, we are “Dedicated to the Promise of Serving You!” Contact us today.